The insectonator has return and this time he is in a zombie shooting game. You will get to smash the zombies with your darts as fast as you can and try to land some headshots. On the top of the screen you will get to see your achievement status and as soon as you complete one you get a few bonuses. Once on the ground you can shoot the zombies again to redeem the kills for them. Shoot the ones carrying all kinds of explosives to deal some area of effect damage. Get new weapons and destroy all the zombies in each level. 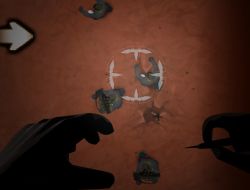 Use the mouse to aim and fire your weapons. Insectonator Zombie Mode 0.00 between 0 and 10 based on 0 votes.